Jeanna Westmoreland has been Samford University's first lady since June 1, 2006, when her husband, Andy, became Samford's 18th president. This continues an active 25-year career as a teacher, university educator and administrator, and university president's wife. The gift of hospitality is one which the Westmorelands exhibit on a regular basis, as they represent the university in a variety of settings and host individuals and groups both on campus and in their home. As children of ministers, both Jeanna and Andy learned early how to give and receive gracious hospitality. Among her many responsibilities, she serves as executive director of the Samford Auxiliary, a volunteer organization that promotes advocacy for the university and raises scholarship funds. Jeanna also is a member of the Orlean Bullard Beeson School of Education Dean's Executive Council. 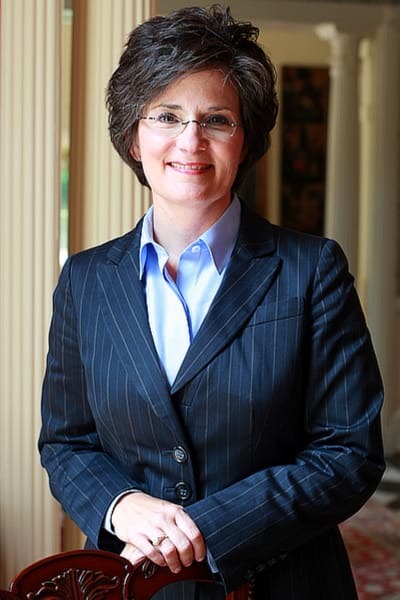 She also serves in an advisory capacity to the Birmingham Women's Committee of 100 and the Alabama Men's Hall of Fame, which is housed at Samford. As a trustee with the Cornerstone Schools of Alabama, she is chair of the Academic Committee. She serves as co-chair of the Birmingham International Center's Spotlight Committee; and as a member of the Math Science Advisory Committee with the Alabama School of the Arts; and is a volunteer consultant for the afterschool program of MPower Ministries. Prior to coming to Samford, the Westmorelands were at Ouachita Baptist University in Arkadelphia, Ark., where Andy was president. In addition to serving as Ouachita's first lady, Jeanna was dean of the School of Education and director of teaching education. She joined the Ouachita faculty in 1991 after 10 years as a public school teacher and administrator in Arkansas. She also has done presentations and led conferences on the local, state, national and international levels, with special emphasis on her interest and work in gifted and talented student programs. In 1981, Dr. Westmoreland earned her undergraduate degree with highest honors from Ouachita and later earned both the master of education and doctor of education degrees from the University of Arkansas at Little Rock. From 2003-06, Dr. Westmoreland served on the State of Arkansas Board of Education, including a term as chair. She has been active for many years in professional education organizations and has served in leadership roles on the local, state and national levels. She has been recognized for her work by Arkansans for Gifted and Talented Education, the Arkansas Leadership Academy and the Arkansas Association for Teacher Education. The Westmorelands have a daughter, Riley, who is a recent graduate of Samford University. They are members of Shades Mountain Baptist Chur ch.